Today’s organizing project is how to declutter and organize seasonal platters, dishes and linens. Before I gave up sugar (a sad day indeed), I loved to bake and wouldn’t dream of showing up for a tennis match without a plate of brownies, blondies or chocolate chip cookies to celebrate a victory. Although I’m sure some people might think serving these sugary goodies atop a 9-inch, snowman-shaped melamine dish in the middle of August was ironic, to say the least, when it came to my salted-caramel, double-fudge brownies, trust me, no one cared what the dish looked like. This being said, I have a feeling even if I wasn’t a champion for less stuff and more memories, I’d still avoid having a surfeit of dishes, mainly because I have no idea where I’d store them in my über-organized condo where everything (not surprisingly) has its place. But for those of you who can’t resist having an assortment of serving dishes for every occasion from Christmas and Hanukkah to Easter or Passover to Halloween and Thanksgiving, here are a few ideas how to organize your seasonal dishes, serving platters and linens year round. Be judicious: You can’t truly get organized until you sort through every themed serving dish and bowl and decide if you’re going to keep it or not. Carefully inspect serving dishes. If they’re cracked or chipped, toss ‘em. If you no longer like, use or want an item, donate it. Before putting anything away, be sure to scrub the shelves and wash all of the dishes as well. Incorporate large platters & bowls into your décor: One year my mom gave my sister and me each a H-U-G-E turkey platter, which besides taking up an inordinate amount of space, is so heavy I need to work out for a week just to lift the darn thing, and that’s without the turkey. My storage solution is to display the dish on the kitchen plant shelf along with all the other dust collectors. The Rule of three: Simply put, if you stack more than 3 serving platters, one on top of another, you’ll never use the bottom platter. If you follow my “rule of three,” it will be easier to get to the middle and/or bottom dishes. Remember to put the heavier items on the bottom. If you’re thinking to stack the platters more than three high, think again and add more shelving instead. This system works well with pots and pans as well. 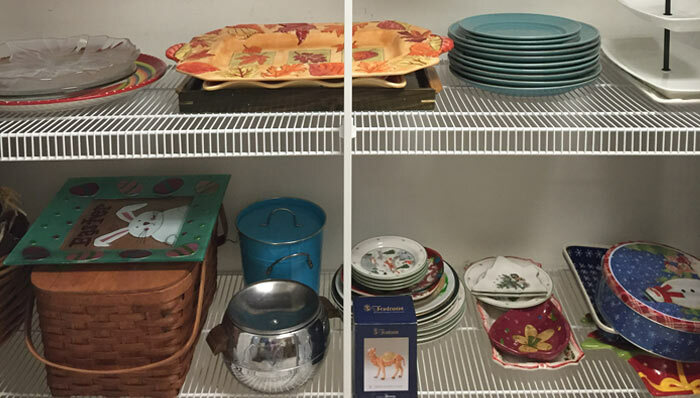 Store “like” items together: Since most people don’t have the luxury of excess space, let alone the wherewithal to categorize their serving platters by holiday, it’s best to separate items, not by holiday, but rather by shape – round bowls, oval bowls, square plates and rectangular-shaped plates – for easy storage. Protect your serving dishes: buy a roll of heavy-duty rubber shelf liner – the kind with ridges – to cut into a variety of sizes, which should be placed in between platters and bowls to protect them from chipping. This is also a great idea for protecting the bottoms of your everyday pots and pans. Think ergonomically: Rather than putting heavy platters and bowls on the highest or lowest shelf, these items should be stored at waist level making them easier to reach. The less reaching and/or bending you have to do, the better it is for your back. Nix the cardboard: Unless you’re planning on selling your Spode Christmas Tree china, in which case it makes sense to keep the boxes, I suggest removing the dishes – dinner plates, salad plates, and soup bowls, et cetera – from the cardboard box and simply stacking the dishes in your pantry, laundry room or guest room closet, along with the other seasonal dishes and serving platters, until Christmas rolls around next year. Linens: Dry clean and/or wash and iron your linens immediately after each use. Any stains not removed will “set” into the fabric making it virtually impossible to remove them a year from now. Store smaller items (napkins and placemats) in a drawer and hang larger items, such as tablecloths and runners, in a closet; making sure to remove the dry cleaning plastic bags.